Dan - Owner and NAUI Instructor #52320. 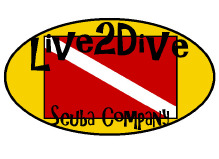 My mission in opening and operating Live2Dive Scuba Company is to give new and intermediate divers an amazing experience in our store and in the water. Let's face it, diving the cold waters of California's North Coast is not for everyone. But if you want to learn how to dive there is no better place to learn. From our waters you will be competent to dive most places in the world. So you don't have to be a cold water diver the rest of your life. Learn from us and then explore the warm clear waters of the world!